* To the left of the Sitting Room fireplace the original spiral stone staircase (which is narrow and steep – difficult for anyone with mobility problems) leads into the Master Bedroom. 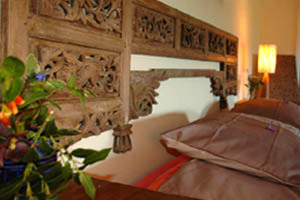 * The large and attractively decorated room has a super king size bed and a unique hand-carved antique Indonesian headboard. 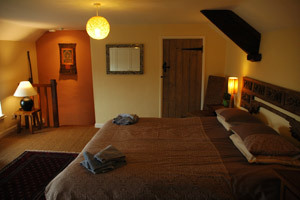 The bed can be changed to two single beds if visitors prefer. 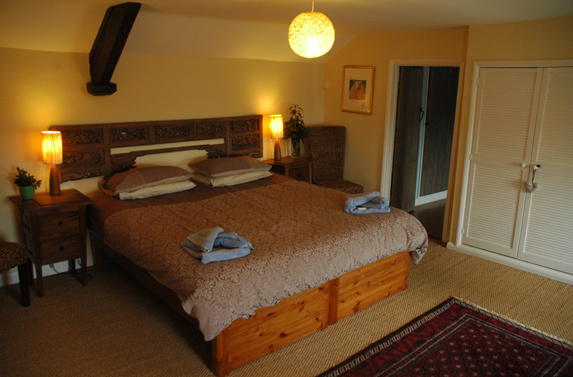 * The furnishings include handmade Lombok chairs, original teak bedside cabinets, a chest of drawers and a large built-in wardrobe with a spacious shelf. 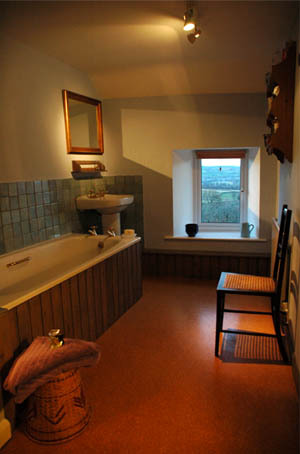 * The en-suite blue tiled bathroom has a bath, wash basin, WC and large airing cupboard which is particularly impressive for a house of this age.